The National Buffalo Chicken Wing Festival in Buffalo, New York is usually only known for two things: copious amounts of chicken wings (forty tons!) and blue cheese dressing. But recently, the festival celebrating the football game-day delicacy also included a nod to cruelty-free eating with its first-ever vegetarian wing alternatives. Steven Binks, a local chef, introduced the first animal-free wings ever in the festival’s 12-year history at this year’s event. At the BlueCross BlueShield tent, thousands of festivalgoers got to sample the breaded green beans wing impersonator with a hummus dip. Binks, who is also a television personality on WGRZ’s “Healthy Zone,” flavored the wings with a balance of Frank’s hot sauce and gorgonzola cheese to recreate the Buffalo Wing taste without the meat. The National Buffalo Chicken Wing Festival in Buffalo, New York is usually only known for two things: copious amounts of chicken wings (forty tons!) and blue cheese dressing. But recently, the festival celebrating the football game-day delicacy also included a nod to cruelty-free eating with its first-ever vegetarian wing alternatives. 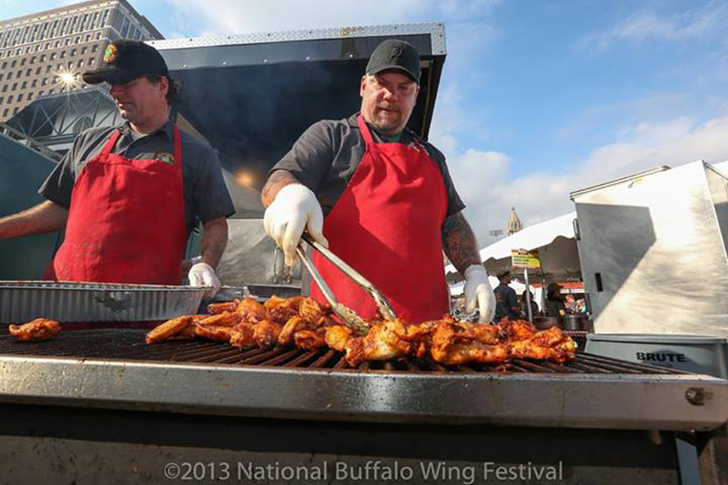 Steven Binks, a local chef, introduced the first animal-free wings ever in the festival’s 12-year history at this year's event.